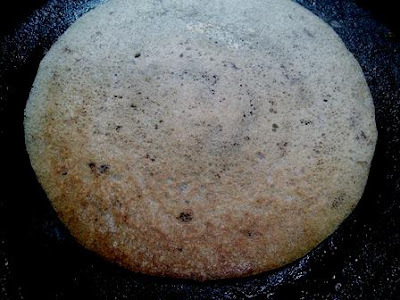 Black urid dal dosa also called as mulu ulundhu dosa in Tirunelveli. This is a famous breakfast dish in Tirunelveli. 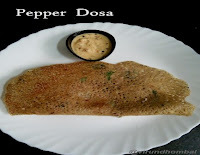 This is an easy and healthy dosa with rice, black urid dal and fenugreek. 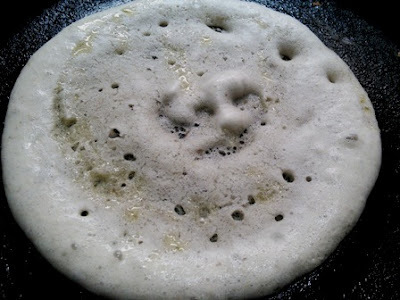 We often prepare this dosa for weekend breakfast or dinner. The addition of black urid dal with its skin is what it makes it so special and unique. Black urid dal contains a lot of nutritional value. In most of our food items we include black urid dal rather than the white variety. This black urid dal is also super easy to make with simple two step process. I use split black gram dal in this recipe, but you may also use the whole black gram dal. Many people have a doubt that if black split grams are ground along with the skin then how it will taste. It is very tasty if they are ground and fermented properly. 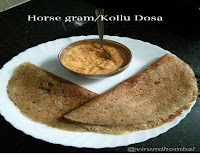 The best accompaniment for this black urid dal dosa are onion garlic coconut thuvaiyal, ellu podi and powdered palm jaggery. 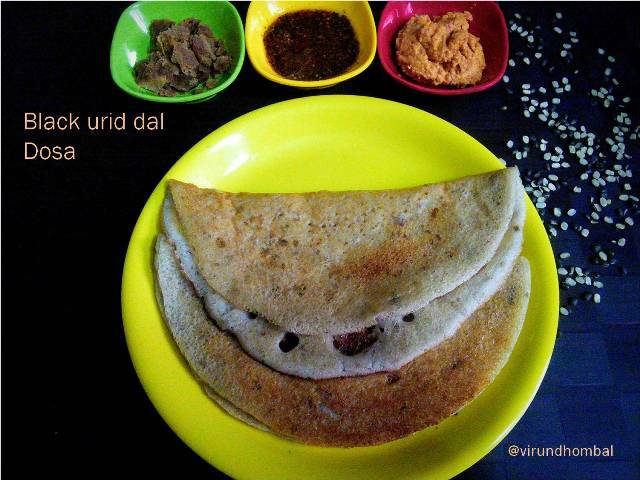 Black urid dal dosa - This is an easy and healthy dosa with rice, black urid dal and fenugreek. The addition of black urid dal with its skin is what it makes it so special and unique. 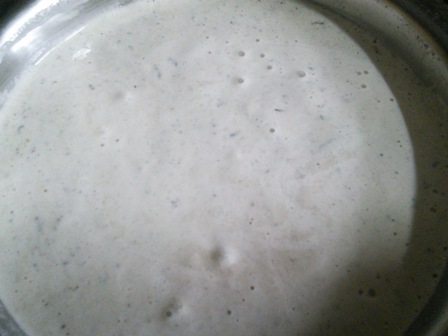 Measure and add the idly rice and raw rice in a big vessel. Add 4 cups of water and soak it for 3 hours. After 3 hours, rinse it for 3 times. 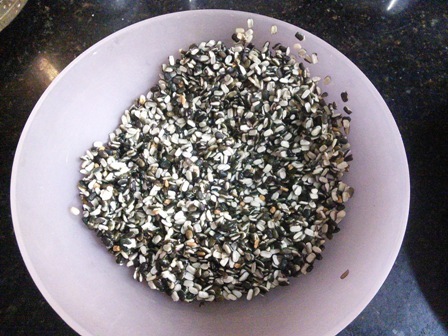 Take black urid dal and fenugreek in a separate bowl and soak it for 1 hour. After 1 hour ,rinse them for 3 times. While rinsing some skins from black urid dal will be seperated. Start by grinding the urid dal first. Add it to grinder and sprinkle water. Grind it for 12 to 15 minutes. 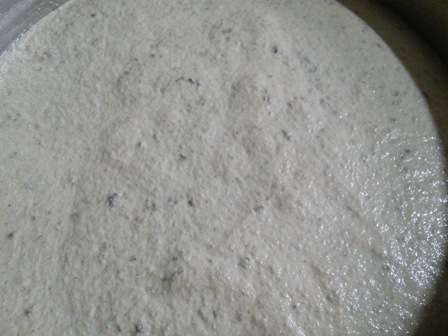 Then remove the urid dal batter from the drum in a mixing vessel. Next, add the rice and grind it smoothly. 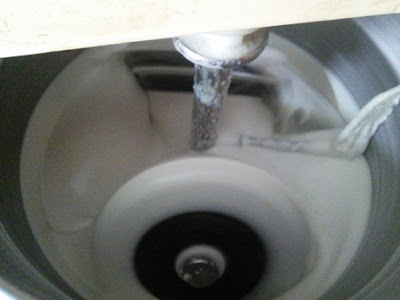 Add water in regular intervals and then grind it. Scrape the sides and grind it. Now transfer the rice batter to the urid dal batter. Add some water to grinder and rinse them and add it to the batter. Add the required salt and mix them well with your palm. 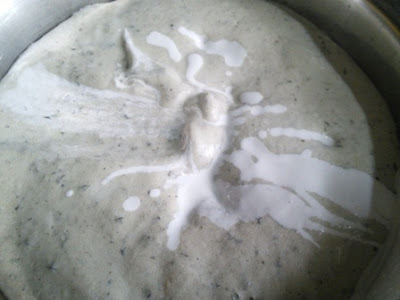 Close it with the lid and allow them to ferment for 12 hours. 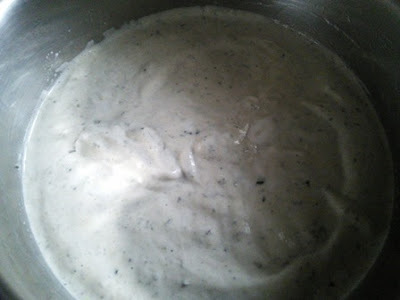 After 12 hours, mix the batter well with the ladle. Heat the dosa pan on medium heat. Now take a ladle full of batter and start from the centre and gently spread it in a circular motion. Add 2 tsp gingely oil around the dosa. Use the spatula under the dosa and gently flip the dosa. Cook for 1 more minute and remove from the pan. 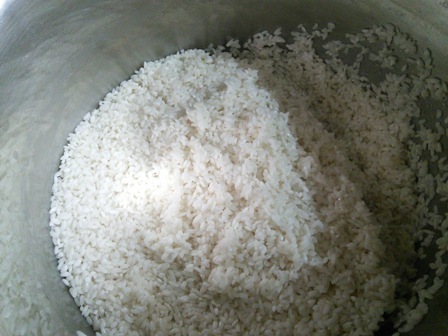 Measure and add the idly rice and raw rice in a big vessel. Add 4 cups of water and soak it for 3 hours. After 3 hours, rinse it for 3 times. Drain the water completely. Take black urid dal and fenugreek in a separate bowl and soak it for 1 hour. After 1 hour, rinse them for 3 times. While rinsing some skins from black urid dal will be separated. (Do not soak more than 1 hour because all the skins will be separated while rinsing). Start by grinding the urid dal first. Add it to grinder and sprinkle water little by little. Grind it for 12 to 15 minutes. Then remove the urid dal batter from the drum in a big mixing vessel. (Do not add more water while grinding). Now transfer the rice batter to the urid dal batter. 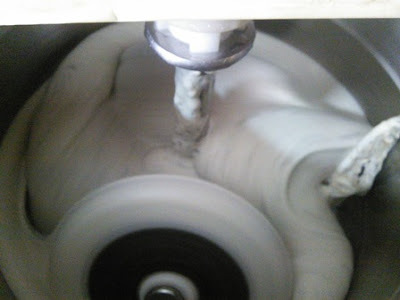 Add some water to grinder and rinse them and add it to the batter. 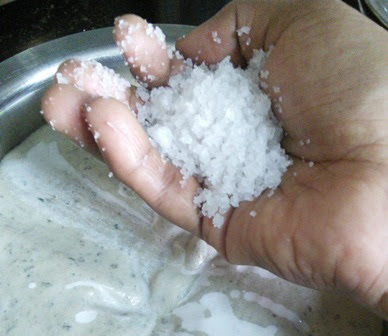 Add the required salt and mix them well with your palm. If you try this recipe for Black urid dal/Mulu ulunthu dosa send us your comments below and share the recipe for your friends and family.